The Kanza Health Clinic will deliver a continuum of quality-based clinical, educational and wellness programs for the tribal communities we serve. Through these services, we will raise our patients to their optimal health status, resulting in a productive quality of life. Our Mission is accomplished by a team of professionals committed to the core values of caring, excellence, respect and team concept in an environment of stewardship which recognizes our Native American Heritage. 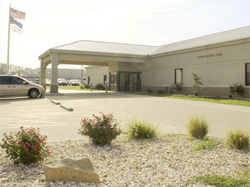 The Kanza Health Clinic is located in Newkirk, Okla., at 3151 East River Road. It is an ambulatory clinic that has been providing health care for Native Americans since its inception of March 1998. It is located within the Pawnee Service Unit which encompasses Kay, Pawnee, Osage, Garfield, Grant, Noble and Payne counties. When the clinic opened, it operated with five employees, but it currently has grown to a staff of 20 employees. It is operated pursuant to Indian Health regulations and policies and is funded through the IHS compact. The “open-door policy” is adhered to anyone who is a member of a federally recognized tribe can receive services. We operate by appointment only and must be furnished with a copy of your CDIB card. We reserve acute slots for same-day appointments. These appointments fill up quickly, and you must call at 8 a.m. on the day you are wanting to come in. No walk-ins. The services provided are by a Family Practice Physician. We also have a diabetic clinic, dental clinic and a women’s health program. Our dental program opened in June 2010. To use the dental services you must be an established patient of the medical clinic. The dental clinic operates on appointments only. Important notice: In order to keep your chart active, you must have a visit in the medical clinic at least once every three years.